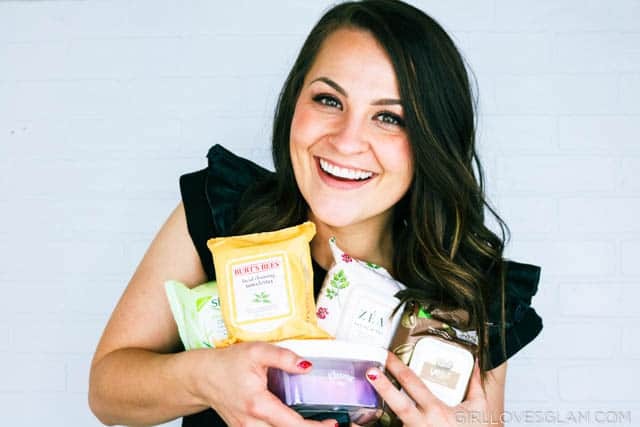 Ever wonder what the best facial cleansing wipes are? Do you find yourself searching online for reviews of different products and wish you could just find a friend who had tried a whole bunch of products that could compare them all of you? Well, you are in luck because I am going to be THAT friend for you! I am SO excited to announce a new series I am bringing you… Battle of the Brands! I will be coming once a month with a category and will be testing several brands of that product. Some of them you can look forward to seeing in the future include drugstore foundation, mascara, long wear lipstick, and concealer. To kick things off, I tested facial cleansing wipes! So, how does it work? I came up with my own little scoring system to grade each of the facial cleansing wipes on more than me just saying, “This one was good” or “This one was no good”. I tested 5 different brands that I have tried in the past. 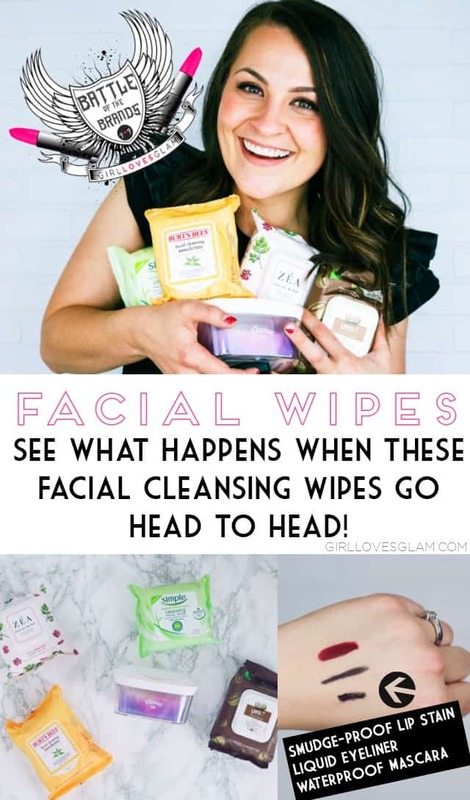 I wanted to try ones that I have tried before because I knew that if I went down the giant rabbit hole of facial wipes that I hadn’t tried yet, I would never be done testing them out. I stuck with some of the most popular brands that I have tried and ones with some of the highest reviews online. This is important to me! 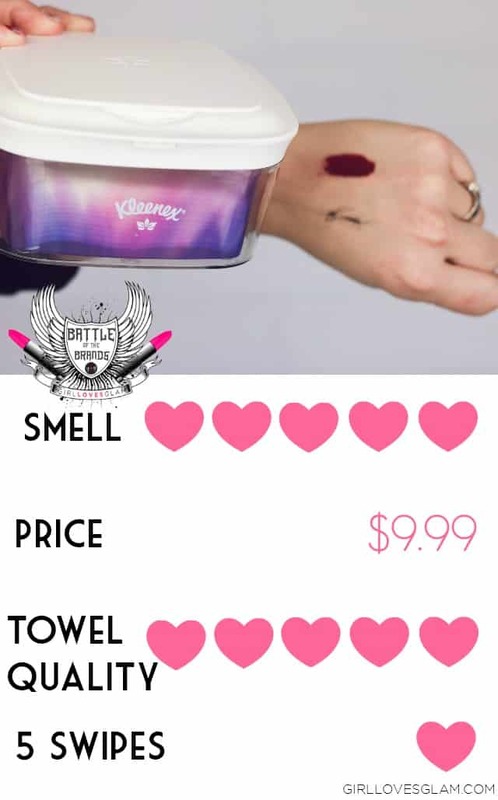 Nobody wants to wipe their face with something that stinks or something that is overwhelmingly smelly. I am just sharing the price for each and for the most part, they are all pretty similar in price. I think a lot of people overlook the towel quality of their facial cleansing wipes. You need to have towels that aren’t going to stretch too much or fall apart. I put smudge proof lip color, liquid eyeliner, and waterproof mascara on my hand and wiped my hand 5 times with each of the towels. The 5 swipe test tells you how well each of them performed when they were used to wipe my hand 5 times. I love the smell of the Burt’s Bees Facial Cleansing Towelettes. It smells clean, but not overwhelming. 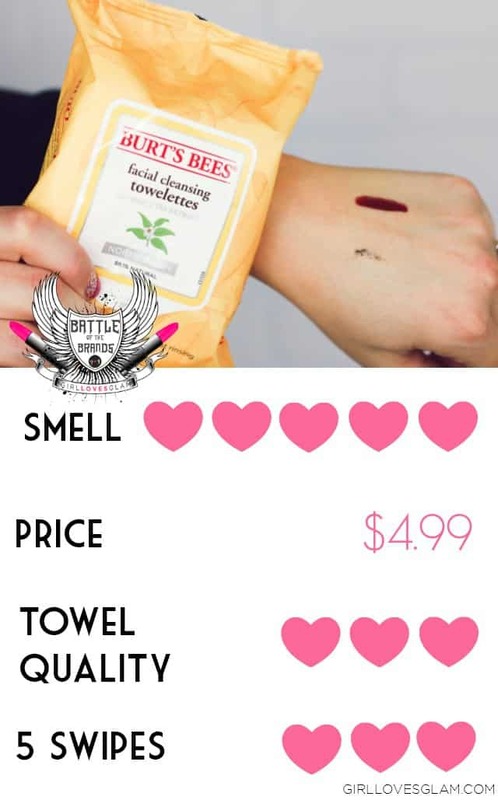 Burt’s Bees Facial Cleansing Towelettes are $4.99. This seems to be on the higher average for price. These towelettes are thin, but they hold together. I wish that they were a little bit thicker, but they are thick enough to get the job done. After swiping the makeup 5 times, the Burt’s Bees Facial Cleansing Towelettes didn’t take any of the lip color off. It took all of the liquid liner off. It started to take the waterproof mascara off. 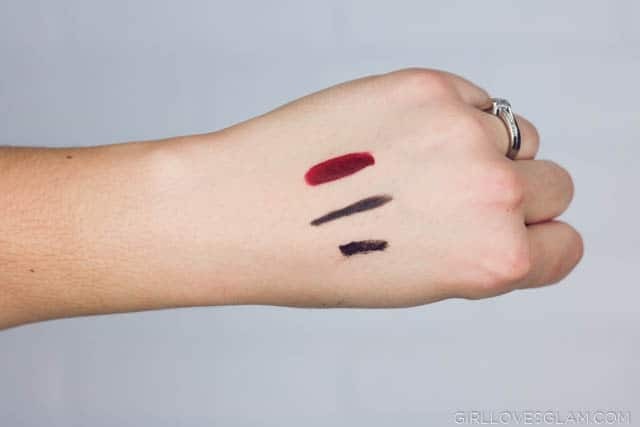 I think with more swipes, it would take the waterproof mascara off, but I don’t know that it would ever really touch the smudge proof lip color. The Kleenex Cleansing Wipes had my favorite smell of all of the facial cleansing wipes. It has an incredibly fresh smell. It makes you feel clean, but not crazy overwhelming. Kleenex Cleansing Wipes are $9.99. This is definitely at the top of the price range, but once you buy the first set, you can just buy the refills for $4.99. These cleansing wipes are incredibly well made! It comes as no surprise that the towel quality is as high as it is, since they are made from Kleenex. They are quilted, thick, and really nice! The 5 swipe test wasn’t great for the Kleenex Cleansing Wipes. These are a lot more effective for cleaning off foundation and getting your skin nice and clean, but not great at removing eye makeup and lipstick. There wasn’t any of the lip color that came off, but it did take off all of the eyeliner and started taking the waterproof mascara off. I was so disappointed in the smell of the Yes to Coconut Cleansing Wipes! I LOVE coconut and had high expectations for this scent. It wasn’t stinky, but it definitely didn’t smell like the delicious coconut that I was hoping for. Yes to Coconut Cleansing Wipes are $4.29. They are one of the least expensive options available. These wipes are really thin and they stretch a lot. They felt like they were going to fall apart. 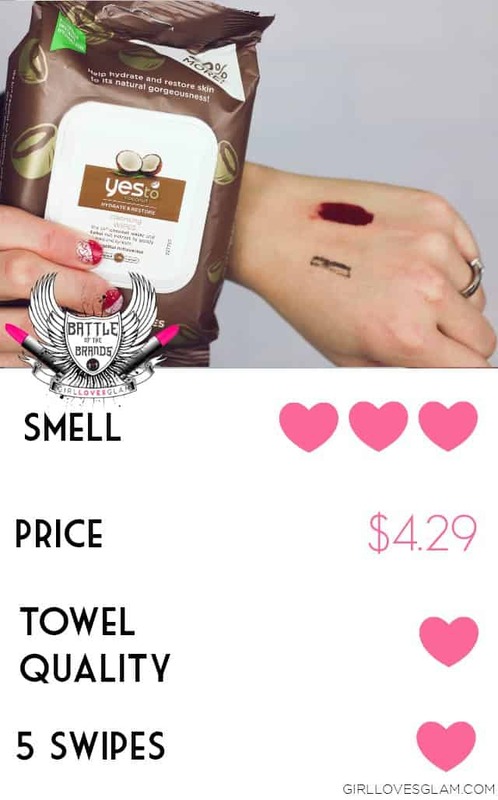 The Yes to Coconut Cleansing Wipes were less than impressive in the 5 swipe test. They were able to take off the liquid liner, but they just smeared the smudge proof lipstick and the waterproof mascara. After I did the 5 swipes, I kept rubbing and it just scrubbed them both into my pores and didn’t actually remove it at all. The ZEA Facial Wipes have a light, essential oil scent. It smells fresh and good. 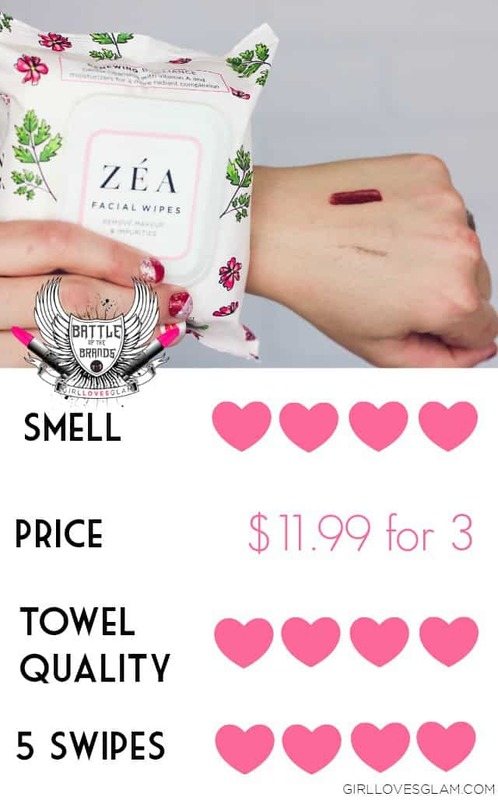 ZEA Facial Wipes are only available on Amazon. But they are on Amazon Prime, so you can get them in just two days! They are $11.99 for a pack of 3. It makes them the least expensive option at $3.99 a pack. The wipes are thin and they stretch, but they don’t feel like they are going to fall apart. The 5 swipe test with the ZEA Facial Wipes came back with pretty good results. It was able to remove all of the liquid liner, most of the water proof mascara, and some of the lip color. I was impressed that it was able to do this, even with clean ingredients. The Simple Cleansing Facial Wipes don’t have a scent at all. This can be a good thing for some people, but it left me pretty disappointed. I like a light scent. It helps me feel a little cleaner. 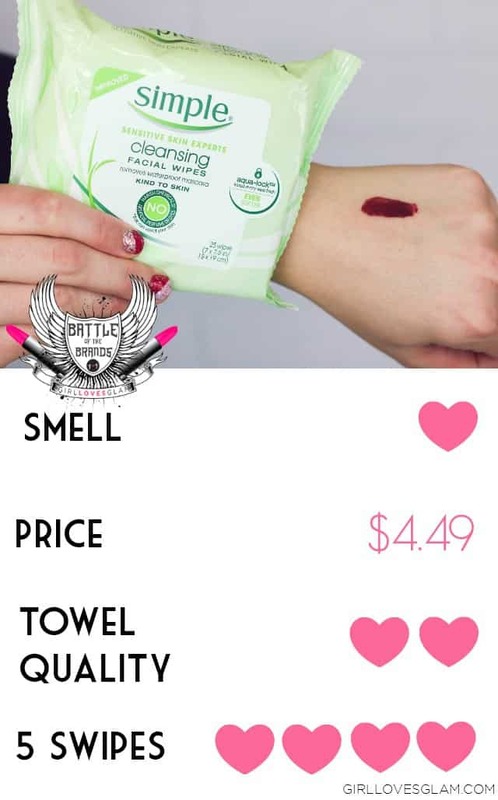 Simple Cleansing Facial Wipes are $4.49. They are pretty mid-range for price. The wipes are incredibly thin and stretchy. I wasn’t impressed with the towel quality at all. The Simple Cleansing Facial Wipes did really well in the 5 Swipe Test. They took off all of the liquid liner, all of the waterproof mascara, and a tiny bit of the smudge proof lipstick. 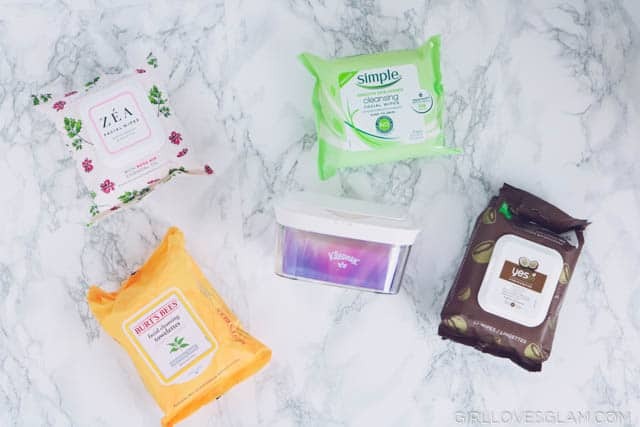 I had a lot of fun trying out each of these facial cleansing wipes! It is so interesting to see just how different each of them are. Obviously these were all just my opinions and experiences. So maybe one of these that I didn’t like as much, is one of your favorites. I would love to hear your thoughts in the comments! Thank you for joining me in my very first Battle of the Brands! Come back next month for another battle. Let me know what products you want to see in a future Battle of the Brands!